Do you require a DJ who will play the songs you want? A DJ with personality who can talk, not just mix? DJ Skip Alexander is an experienced personality DJ, a perfect host for your birthday or wedding celebration. He remembers playing disco music in the 80’s while being raised on the 70’s classics from his brothers. Adaptable to any type of event or function. Supplying the right music for any occasion and creating a fun party atmosphere. Skip will play the songs you like to dance to, your entire favourite sing-a-long tunes and any special requests on the night. Dj Skip Alexander is an experienced nightclub DJ who has been a resident DJ for some of the best clubs across Northern Ireland. 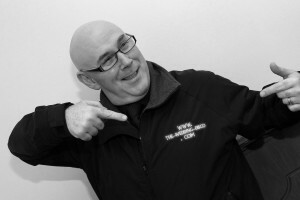 He also worked in community radio as well as playing for Cool FM in past years in their outside clubs like the Lansdowne Court Hotel, The Clandeyboy Hotel, The Paradox in Bangor & The Botanic Inn in Belfast. Most of all he’s approachable, friendly and reliable. Skip has been doing parties for over 25 years and if you have been at any of his gigs, you will see why it is a natural progression along this path. 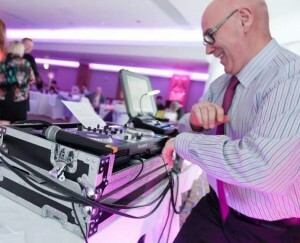 The-Wedding-Disco brought Skip in a new direction, even though it’s where he learnt the skill at being DJ. He has a wealth of experience in providing superb disco entertainment at all levels. Check out The-Wedding-Disco’s feedback from clients which I hope helps you decide if you want to put your party in the safe hands of an acknowledged professional. The whole road show is fully insured to a level of 10 million pounds & the equipment is well maintained,. Skip has a full backup network of professional DJ’s available to provide cover. Also check our Facebook pages for are latest gigs and pictures.